Image caption "My Algeria, your children promise you better days"
Mr Bouteflika had led the country for 20 years - which, in a country where it's thought about 70% of the population is under 30, makes him the only president many people have ever known. "The past couple of weeks have been causing me, and thousands of other Algerians, a lot of anxiety and anger," she says. "So today, waking up knowing our efforts didn't go to waste definitely felt liberating. We've been waiting for this moment for a long time." "As a kid, every single adult around me would glorify him, as though he's some sort of god who saved the nation from terrorism, and he's the saviour everyone has been waiting for after 10 long years of [conflict] for Algeria," she says. "So once I grew up and started becoming more politically aware, I honestly was angry at the previous generation - it was them who kept making him out to be this great holy person, it was them who kept him on the chair [in power] and gave him the confidence to never step down." "When 'he' supposedly announced his stepping down, I exhaled for the first time in forever. One down, more to go." Fellow protester Abdellah Djelti, 27, agrees that Mr Bouteflika was seen as "a white knight, a saviour" for Algeria in the first few years of his presidency. "Algeria in the civil war, it was a disaster," he tells the BBC. "People couldn't go out - if you went out... you'd find bodies outside." Instead of focusing on the past, they wanted a leader who could take them into the future - for example, by investing in education. "Most graduates from universities have no jobs," Mr Djelti says, "because the government doesn't give that importance to people's studies or education, or to scientific research." He adds that there are also few, if any, schemes to help students study abroad, and it is otherwise prohibitively expensive for the majority of young Algerians - something that, as an English literature student, he finds particularly hard. "I had a dream to study abroad, in England or the US, to visit other places. I have this dream to visit other museums because I have a passion for art and history," he says. "But since the situation here [with the government] is so bad... I haven't been able to do any of it." This is partly why he's spent almost two months protesting - and he says it felt "so good". He went from feeling like nothing would ever change to having hope. "The good thing is it was very peaceful, people were providing water, they were providing food... I felt patriotic asking for our rights, and our voice to be heard." Laughing, he adds: "In Algeria nowadays, the Algerian flag is always in your pocket - because you don't know when you'll end up in a protest." Nacerddine Rahmoune, a 23-year-old activist from Sidi Bel Abbès, even introduced demonstrators to a Swedish trend called "plogging". "We took the same concept and gave it an Algerian touch," he tells the BBC, adding that he wanted to instil "an environmental consciousness in the minds of Algerians", while also joining the call for "a new [political] system with young, competent people". 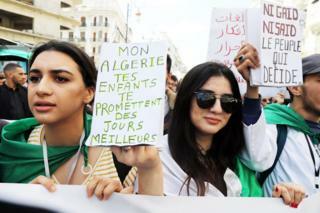 Even though Mr Bouteflika has stepped down, it's clear the protests are far from over. "It's scary," Ms Atmani says. "I'm happy [Algerians are now] aware, but then I'm also afraid there's going to be a major split in ideologies when it comes to choosing who's to become president." Mr Rahmoune agrees, but he's more hopeful about the future: "We hope to see new faces and more youth in parliament, so we have a lot to do."